The nation of Andalus is rebuilding after a bloody civil war, their efforts organized by an elite set of calculating technocrats. Just when life has almost achieved a kind of normality, one of their colleagues upsets the situation. 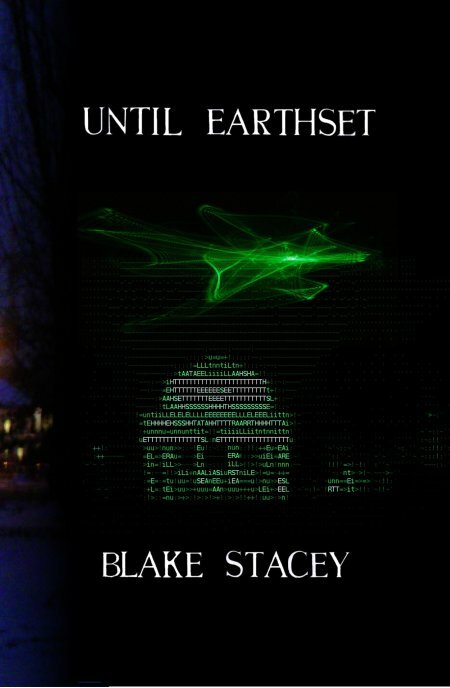 Until Earthset is a story of murder, forbidden love and string theory. It begins with a few people who live in a history which is not quite ours. Fairly rapidly, they discover that they have problems: one of a scientific kind, a few of a personal nature, and one of the criminal variety. When the movie was finished, Devi was still very high, and she began performing an interpretive dance about viruses. Standing with her feet scrunched together and pressing her hands against invisible walls, like a euphoric mime, she said, “This dance represents how I am a sequence of DNA wrapped within a protein shell.” Her hands patted the air about her, tracing her confines. “My shell is an icosahedron, made naturally by sixty trigonal protein segments, all alike. I am an icosahedron because it is the Platonic solid with the most faces, as the last theorem in Euclid proves. I am therefore the closest to a sphere I can be, with the largest volume I can make myself using pieces of this size.” She crouched on top of a beanbag chair. “I attach to a cell and inject my DNA.” She then crawled under the chair, fetus-style, until she was invisible. “I take over the cell’s machinery to make my own molecules. And then—” she burst out from under, darted across the floor, and wrapped around Teo’s leg. Teo pulled her tripping body up to the sofa and positioned her on the center cushion. Devi fell backwards, her head collapsing into the sofa pillows. Cautiously, Teo rested her chin upon Devi’s knees and wrapped her hands around Devi’s thighs. “And how do two of us fit within that shell?” she asked. “Broken symmetry,” Teo repeated. Slowly, she drew her hands away, brushing the forelocks of Devi’s hair in passing.